Learning from failure requires two things. One – we must expect to fail. Two – we must recognize when we fail. In Superforecasting, Tetlock and Gardner suggest that vague terms like “probably” and “likely” make it difficult to access forecasts. Time lag is another learning barrier. Our memory of our own judgment is highly selective and often wrong. Hindsight bias is the cardinal sin. “Ultimately, it’s not the crunching power that counts. 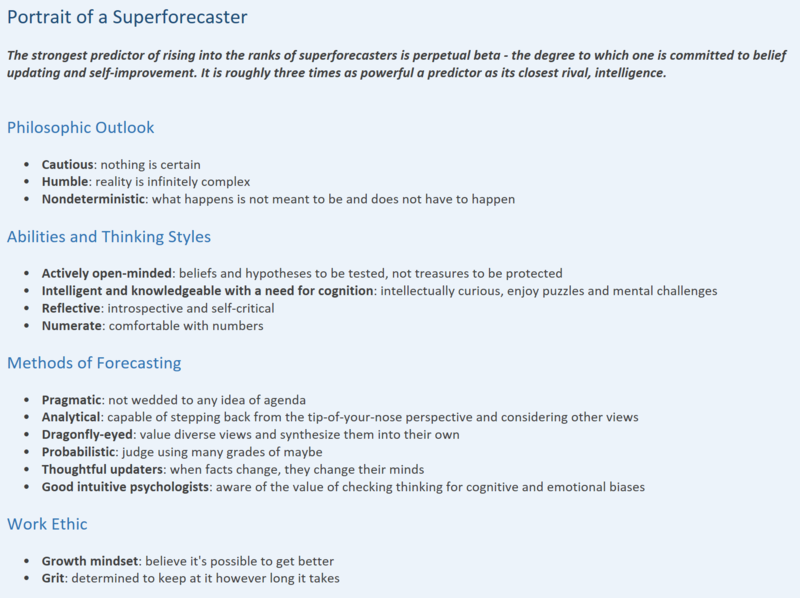 It’s how you use it.” Good forecasts are the product of thorough research and an ongoing assessment of one’s assumptions. Without revision, there is no room for improvement. Thankfully, these habits can be learned. See Portrait of a Superforecaster below. Note that these characteristics also make for a great investment analyst. Pair with Mindset and Grit, both of which were highlighted in this year’s Broyhill Book Club. And definitely check out The Good Judgement Project. Super cool stuff here for those of us always striving to get a little better each day.